DBA Series in-line and top-mount dampeners reduce system pulsation to improve flow control, increase yields, protect components, and minimize downtime for repairs. They are designed for PFA, PSA and PXA Series pumps capable of pressures up to 7 Bar (100 psi) and temperatures of 100°C (212°F). 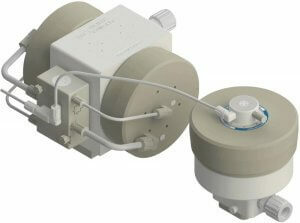 DBA030 dampeners fit 30 and 60 lpm pumps; DBA060s fit 30, 60 and 140 lpm pumps; and DBA140s fit 60 and 140 lpm pumps. 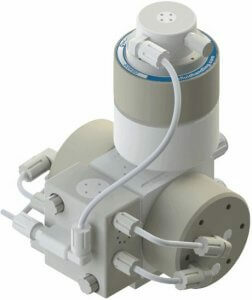 Top-mounted DBA030 pulse dampener with PSA030 ambient temperature pump. 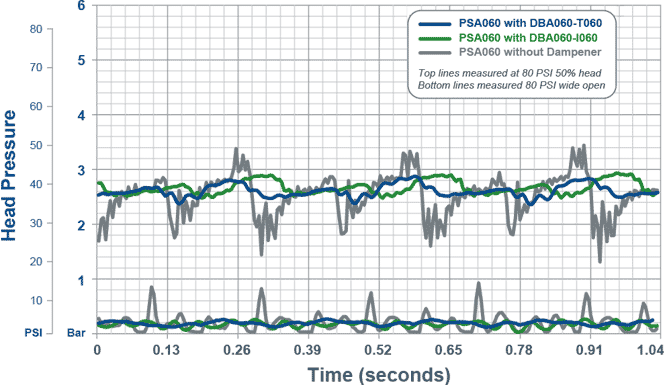 Select options for corresponding pulsation data. *DBA030 dimensions 'D' and 'E' increase by 0.27 in. when configured to a 60 liter pump (configuration DBA030-T060). *DBA Series dampeners are compatible with PFA, PSA, PSR, PXA, PL, AP, and X Series pumps. *DBH Series dampeners are compatible with PFH, PSH, PXH, and AP-FM Series pumps. *DBU Series dampeners are compatible with PFU, PSU, PXU and AT Series pumps. Contact White Knight for copy exact code activation information.